Grab a Hot Cocktail and a Blanket—Outdoor Season Isn't Over Yet! ​Just because summer has come to an end doesn't mean that outdoor entertaining season is over. With the glow of a fire pit and some pretty lighting (not to mention a few blankets to snuggle up under), you can extend the patio parties well into October. We've rounded up ten of our favorite outdoor entertaining essentials perfect for backyard s'mores nights and cozy nights on the deck. 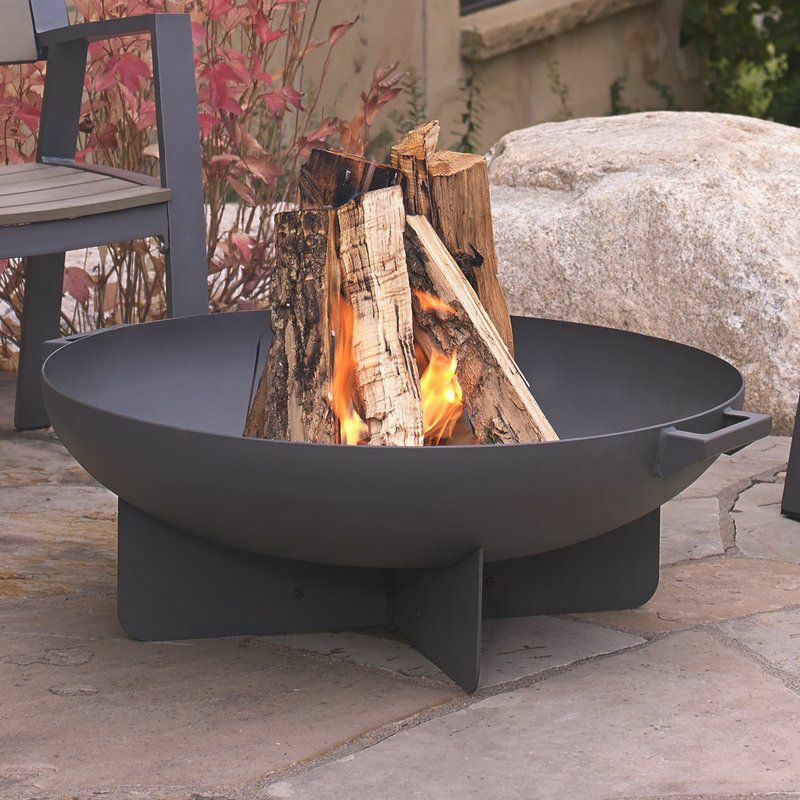 When it comes to making your outdoor space cool weather-ready, the fire pit is key! Heat is one obvious reason, but think of the smell, the potential for s'mores and all the extra time you'll get to spend gazing up at the stars. Be sure to do some research beforehand—fire pits come in a huge variety, from wood-burning to gas, electric and combinations of those, as well. What could be more fun than this? 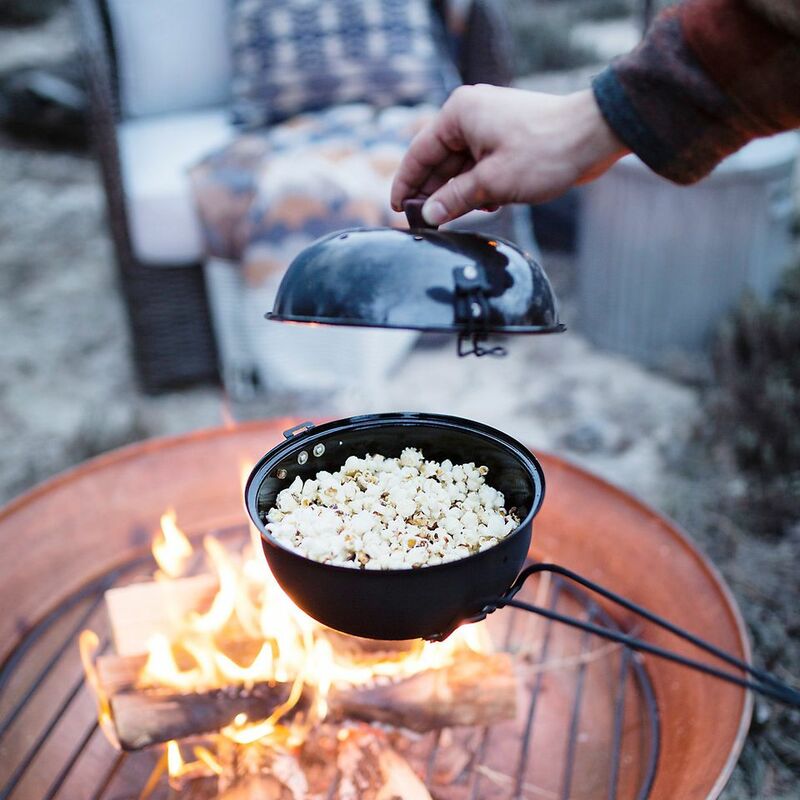 Whether you use this popcorn popper at a campsite or in your own backyard, it's always the right time for this salty treat. Keep this festive and unique fireside tool at the ready for impromptu outdoor nights, cozy at-home dates and family gatherings. With the sun setting earlier in the fall, having your outdoor lighting set up on point is even more important. We love these lanterns from Pottery Barn that come in a variety of sizes and are big enough to hold multiple candles (real or faux!) for a cool, layered look. Another key element of your outdoor fall tablescape is your dinnerware—all the plates, bowls and platters that help set the mood. We love This rustic set from Williams Sonoma that comes in a variety of hues, but the classic ivory is our favorite of the bunch. Ah yes, it's hot cocktail season. Time to retire the lemonades and gin and tonic cocktails and start sipping on a little whiskey and cider or a hot toddy. These bistro mugs are perfect for serving up warm drinks on chilly evenings. Beautiful outdoor lighting is important all year long if you ask us. But during the fall months, a little extra glow can really help set the mood. Picture it with us: the fire pit is roaring, orange and red leaves are falling on the grass and you're basking in the warm, twinkling light of these globe string lights... You're totally with us now, right? A simple way to give your outdoor space that "fall feeling" is to replace light colors and patterns with those that feel more deep and rich. We love these textured navy pillow covers from Serena and Lily that still have a festive, California coastal vibe. Little things can make a big difference, right? There's just something so autumnal about antlers and a simple, understated monogram letter. This doormat from Mark and Graham is just the thing to take your front porch or back door gently into the new season, and welcome your guests with a touch of fall style. When it comes to cozying up outdoors in the fall, not just any ol' throw blanket will do. You need something that looks and feels right for the season. We recommend any of the cool, Western-inspired blankets from Pendleton Woolen Mills, but are partial to the striped wool 'Yakima' camp blanket, which as a more rugged feel and heavier weight. These blankets are as ideal for Instagram as they are for keeping you toasty warm while you're toasting marshmallows in the backyard. ​Yes, yes, oh yes. What's better than pizza? Pizza cooked yourself on your patio while wearing a fisherman sweater and sipping an Aperol spritz, that's what! If you and your family and friends love a good casual Italian night at home, you won't regret splurging on this very specific and very amazing outdoor pizza oven. Whether you arrange your furniture set around a fire pit or a coffee table covered in smores and bowls of popcorn, it's important to have a cozy place where you can gather under blankets and twinkling lights to relax and take in the fresh fall air. If you don't have the ability to manage real plants and grass and greenery in your outdoor space (a New York City balcony, perhaps?) you can still create the escapist atmosphere with faux plants. Target has a huge selection, and most can stand up to some mild abuse from the weather gods, which means you can leave them outside well into the winter. A commercial patio heater will make even the chilliest nights feel warmer. Just be sure that if you have a patio or balcony, your building is zoned to allow these types of gas heaters. Don't forget that you'll get a lot of bang for your buck with LED lanterns that look like candles. They don't make a mess, last for seasons and look just as good scatted and clustered on your outdoor dining table.